Enjoy perfect sound, spin and speed without glue, enjoy XTEND HS! The new STS-rubber, developed for the coming glue regulations. 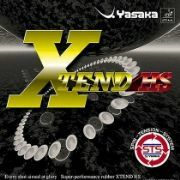 With STS-technology (Spin-Tension-System) Yasaka has been able to concentrate the “tension increase” on the spin characteristics. With this concept the “spin tension” increases around 2/3 and the “speed tension” around 1/3. XTEND HS is based on the STS-technology, but with improved energy increase. XTEND HS gives you more spin and speed, especially suitable for the coming glue regulations.